I don’t remember what bookcases I had as a child. I must have had them, because books must live somewhere and we were in a rented property where we weren’t supposed to drill, but they don’t seem to have stuck. I remember the wooden pelmet over the window when we first moved to Cobham, wide enough for a small pile of books and easy to reach from my upper bunk (I had to take the upper, my brother used to fall out of bed), and the row of Jane Austens and the big green book of the Bronte sisters that lived on the sideboard for years (Do people still have sideboards with drop leaf drinks cabinets and shallow shelves for ornaments? They seemed so sophisticated when I was a child, and so dated now.). I don’t remember any other books in that first flat. Paperbacks, old Fontana Agatha Christies with wasps and apples and dripping blood on the covers, were kept in the cupboard under the stairs, along with the meter and a pile of 50ps to feed it, but that was a little later and I had my own bedroom with woodchip walls and a lampshade and curtains in the same shiny pink material, and an unused metal fireplace which had my radio cassette on. But where were my books? I had them – four of the fairy books, although I remember the pink best, an anthology of poems (It had the one which begins hurt no living thing, ladybird nor butterfly), all the Narnia books, most of the flower fairy ones including an wall alphabet which concertinaed, the Wizard of Oz, a big green book of the hobbit I think my brother borrowed, again with illustrations. There must have been thirty Enid Blytons, acquired one by one, some second hand and some new, the famous five and the secret seven and one with a character called fatty whose real name was Frederick, and a dog who closed doors behind him. Mr Pink-Whistle and The Last of the Dragons and some others, Mrs Pepperpot and The Phoenix and the Carpet. The Last Legionary Quartet, Grinny, Star Wars, the Stainless steel rat, Charlie and the Chocolate Factory, Elidor and the girl guide annuals one of the other kids in the street kindly brought in for me when I got knocked down and couldn’t go out. They all fell apart under the pressure of my hot little hands I expect, read in the bath, in the cloakroom at school while the rest of my year were watching Smokey and the Bandit in the main hall for the umpteenth time, read in bed and on car journeys. Many I outgrew and weeded out. There’s no mystery about where they went, only where they were housed when I had them. I remember the second bedroom I had to myself had white curtains with blue flowers, and between the windows was the doll’s house I broke over the years – climbing on it (or keeping, now I think back, books in it, but surely I had shelves as well?) I remember having a clock radio with green glowing digits, and a pink electric blanket, and a chest of drawers with doors beneath, formerly white and now painted grey. And now I do remember a bookcase that I tried to decorate with varnish and cut out bits of wrapping paper, a technique I later learnt was called decoupage. It must have looked awful..
I’ve no idea what happened to it. Perhaps it ended up in the shed when we moved again and I put up my own shelves - two pink ones on brackets and then three or four long boring brown ones on bronze coloured wallbars, the top row high to reach unless I stood on the bed, accidentally dusted with mauve and duck egg dots, like everything else in the room, after I stencilled dragonflies up the walls and onto the ceiling and chased them with a waterspray bottle of the same paint. I don’t remember if I owned any books I didn’t read. I don’t think so - but since I recently tested how many of the books I own now that I’ve actually read (by the simple method of moving all the unread books on my current bookcases to the right of the shelves) - and found that I have only read ‘most’ of them if by ‘most’ I mean ‘slightly more than half’, I’m not as confident about this as I was. 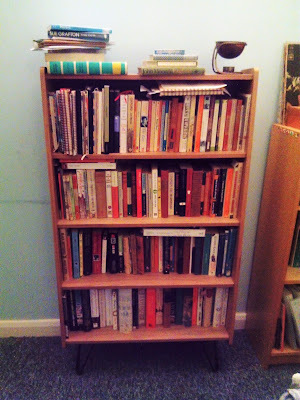 Current bookcases are 4 narrow ‘Billy’ bookcases, one wide one, a stepped cream coloured case from Laura Ashley, and a largish bookcase with wire legs, so this really is quite a lot of unread books. And that, now I’m aware of them, seems a shame. If I’m not going to read them I should probably pass them along to someone who will. I’ve had this thought before - there is a pile of penguin travels stacked up at the moment as the plan (about 2 years ago) was to read them one by one and decide whether to keep them or give them away. I did start – and that put me on to The Innocents Abroad, by Mark Twain, so it wasn’t entirely wasted - but I completely forgot the original plan. There is also a pile of books waiting to go to the bookswap which I’ve mentioned already, with the addition, now, of The Flight from the Enchanter, by Iris Murdoch, which I gave up on after 100 pages. 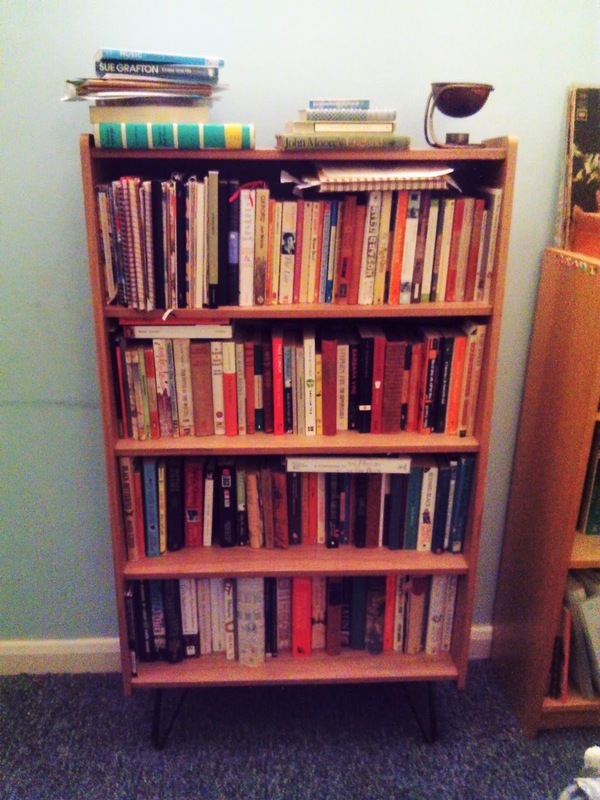 with unread books sorted to the right.